WEST LAFAYETTE, Ind. – Before the 2017 season began, quarterback Tanner Lee said he transferred from Tulane to Nebraska for the big games and the big moments. In the biggest moment of his season, he came up bigger than he ever had. Fourteen seconds left, down five, Lee connected on a slant with wideout Stanley Morgan Jr. to put the Huskers up one and cap an eight-play, 70-yard drive securing a 25-24 win. For the first time all season, Lee looked like the guy that had been hyped in the offseason. You had seen glimpses of it a month ago on the road at Illinois, some more against Wisconsin and a few against Ohio State. But Lee’s arsenal was on full display against Purdue, and it wasn’t just the final drive. Lee threw it a career-high 50 times without any threat of a rushing attack to keep the defense honest. The Nebraska run game sputtered to a season-low 40 yards on 27 carries, but Lee poured it on for a career-high 431 yards and two scores on a 64 percent completion rate. In the fourth quarter, when Nebraska totaled minus-4 yards on the ground, Lee hit 70 percent for 192 yards. The 431 yards tied former quarterback Zac Taylor for fourth-most in a game in program history. It's just the seventh time a Nebraska quarterback has ever topped the 400-yard mark and its the first time since Ryker Fyfe did it in 2015 against, surprise, Purdue on the road. Lee's success through the air also paved the way for historic days for his receivers. Morgan topped 100 yards on six catches (112 yards to be exact) for the fourth time this season, tying a program record. Tight end Tyler Hoppes (105 yards on five catches) also nabbed the first 100-yard game by a Husker tight end in a decade. Seven different receivers caught a pass. Five had five catches or more. Lee shared the love and spread the ball around all evening. What makes the performance even more impressive? Every aspect of the game was working against Lee. The atmosphere around Ross-Ade Stadium was cold and windy, perfect for Big Ten football but not so much for prolific passing nights. 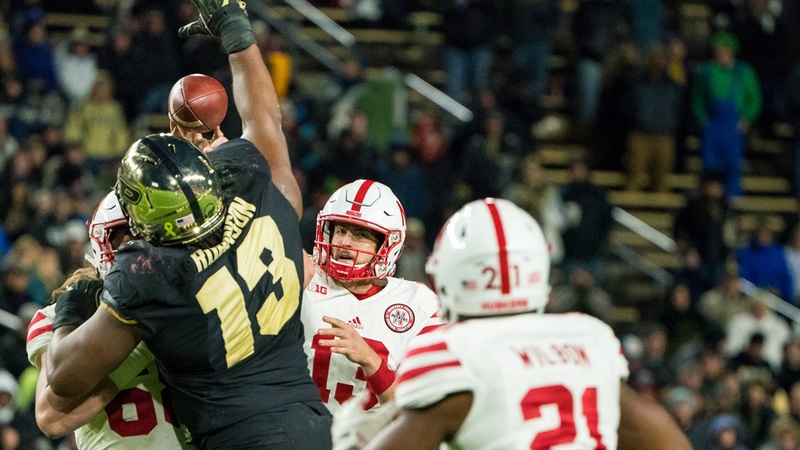 The Boilermakers completely took away Nebraska’s ability to run with constant coverage adjustments and an aggressive front line that stifled the Huskers’ blockers all evening. And the line didn’t fare much better in pass protection either as Lee was sacked three times and faced pressure most of the evening. Lee’s success masked what was an overall tough night for the offense, there’s no doubt about it, but on the last drive, when Nebraska needed a play the most, Lee delivered. Everything worked. Lee completed seven of his eight attempts. He was on time with throws and cognizant of the clock, the Huskers’ timeout situation and the boundary. Every throw was to the edge and everyone knew to get out of bounds. Langsdorf said to credit Lee for that. It took Nebraska all of 68 seconds to drive the field. “We knew it would be tough with no timeouts but I think everybody wanted to get it done and I think everybody knew we could,” Lee said. Hoppes said Lee was the guy on the sideline hyping up the offense, telling them it was time to go win the game. Lee just wanted to finally see one end the right way. Lee had time on the final possession too, maybe the most he had all game. Senior corner Chris Jones said when that happens, it’s lights out. He knew Lee was going to produce. Langsdorf said there are things that need to be cleaned up. He didn’t like the blocking at times and everyone owned up to the fact that the running game needs to be better, but for tonight, he said it’s about celebrating with his team and with his quarterback whose struggles appear to be a thing of the past. After the game, in the southwest corner of the stadium Lee found Langsdorf and jumped into his arms. The two shared a hug, a smile and a few words. It wasn’t pretty, but it was enough. Enough to get a win and stave off questions about the future for a little while longer. Enough to silence (maybe for good) the questions about another quarterback taking his place. Enough to prove that preseason Lee wasn’t a fluke. Lee's best was just enough, but it came at the best time.